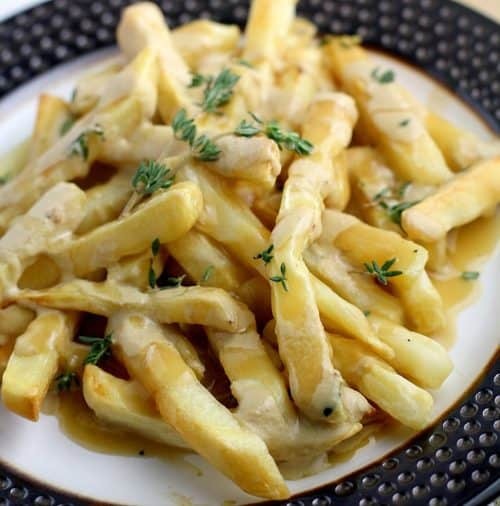 Crispy french fries smothered with two killer sauces, a Dijon Thyme Gravy and Cheddar Beer Sauce …and it is all vegan! Pub food, game food, comfort food, party food, whenever food that we can feel fantastic about. Because we care about ourselves and the planet, but we still want to get our grub on too. Which is precisely why I want to make recipes like this where we can have it all. So what the hell is poutine, you say? Poutine is a classic, Canadian pub dish where french fries are covered in a light brown gravy and then cheese curds. Sounds kinda awesome and terrible at the same time, don’t you think? And I have actually never had it. But I have been enamoured with the idea of poutine. Seriously. For kinda a long time too, now that I think about it. And it was this weekend that I decided to finally give it a try. Alright, what I did here is pretty straighforward. First, the Cheddar Beer sauce. Remember when I used cashews with avocado to make a sub for sour cream on Twice Baked Potatoes? Then remember when I used cashews to make a totally believable copycat of Boursin cheese? Well, now I am using cashews to make a cheese sauce! The cheddar aspect of this is coming from the nutritional yeast. Nutritional yeast is a veganny thing, it gives a cheddary flavor in recipes. My regular grocery store carries it in the health food and supplement section, and any specialty store like Whole Foods will carry it too. Amazon even has it. (then again, Amazon has everything.) …Then to complete this sauce and make it tasty tasty was adding the beer. I am from New England, beer cheese is important. So to make a vegan version, for me, was crucial. And I am gonna put this on everything – Welsh Rarebit, potatoes (OMG this would rock on potatoes), maybe add some vegan cream cheese for a bread dip. Lord only know where this sauce will take us. And then this gravy! Holy hell this is SO damn good. THIS gravy will now be MY gravy. For all occasions. This starts out as a very standard gravy: butter, flour – make roux – add stock – kind of gravy. But then we make it extra special with some fresh thyme and a splash of stout beer to add body and depth of flavor. I am so happy with this gravy. This is absolutely going to be my new go-to. So that’s it kids. 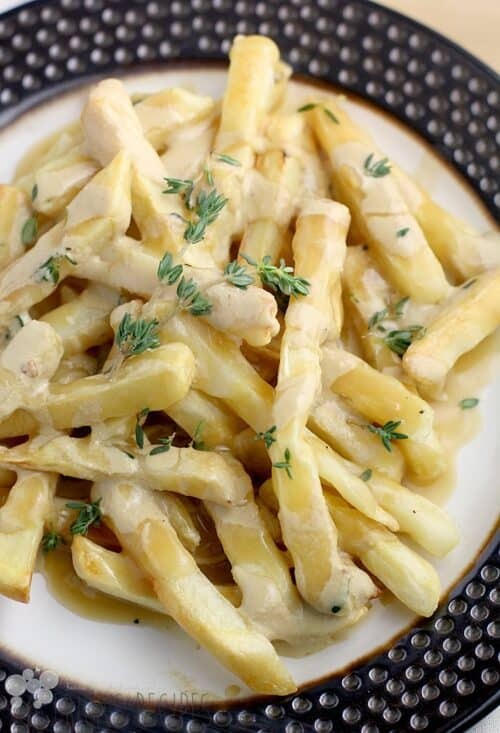 We enjoyed these fries as part of a larger “pub night” themed spread. They were perfect – exotic, indulgent, tasty tasty. Different, something new. And totally delicious “grub”. Crispy french fries smothered with two killer sauces, a Dijon Thyme Gravy and Cheddar Beer Sauce ...and it is all vegan! Cook the french fries according to package directions. While the fries are cooking, prepare the Cheddar Beer sauce and Dijon Thyme gravy. To make the Cheddar Beer Sauce, add all the ingredients except the beer to a food processor and process until very smooth. Add the beer and transfer to a saucepan. Heat on medium, stirring often, until thickened. Remove from the heat and set aside. 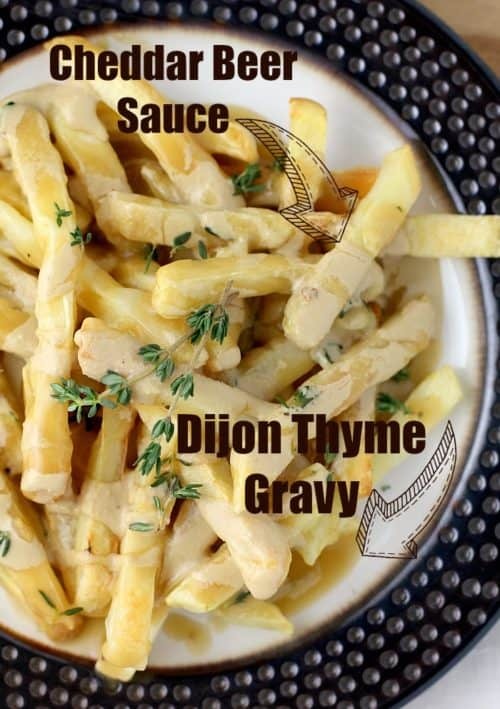 To make the Dijon Thyme gravy, heat the butter and flour in a saucepan until smooth. Cook a minute to make a roux. Slowly whisk in the broth and beer and cook, stirring constantly, until the mixture thickens to make gravy. Add the remaining ingredients. Remove from the heat and set aside. 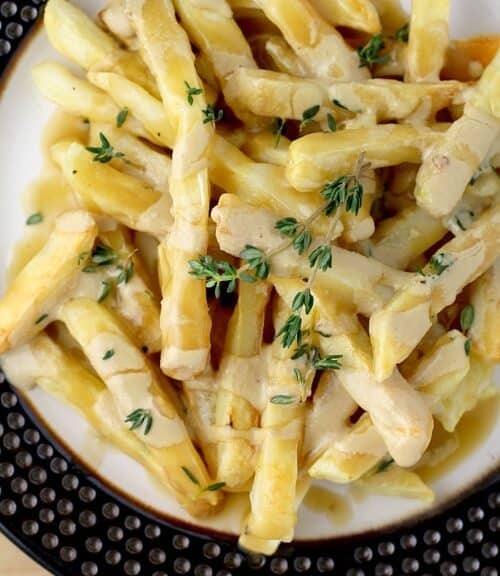 Serve the fries drizzled with both sauces. Yields: 4 servings. As a Canadian, I approve this vegan alternative to one of my favourite past[life]tiimes! I do miss a good poutine every once in a while. 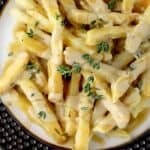 Hey love this recipe though I thought I should let you know as this a vegan recipe that Guinness isnt vegan friendly, though they are working on it.